Red-neck ‘racists’ and ‘neo-Nazis’ protesting angrily in Australia’s capital cities against the threat posed by Islamic extremism. Their counterparts on the picket line? ‘Anti-racists’. A clever title really, because immediately it makes us all (I hope) go: ‘yep, that’s me, I’m an anti-racist for sure’. By extension that means I disagree with whoever they disagree with. Great, I can go back to my day pleased that I’ve sided with the anti-racists against whoever they’re opposing today. Calling someone a ‘racist’ is probably one of the most serious charges that can be levelled at someone in today’s politically correct climate. And in a way, that’s great, because racism has no place here. But it’s got to the point where the ‘racist’ tag is used almost whenever you don’t like what someone else is saying. It’s the debating equivalent of a ‘get out of jail free’ card: no one dares to question its deployment. 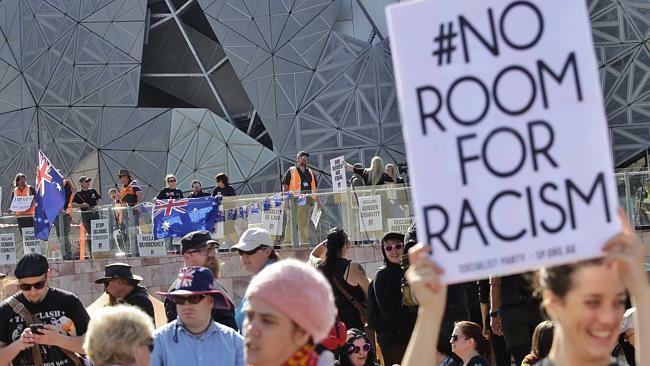 Reclaim Australia, one of the groups protesting, don’t seem to talk about Africans, Arabs, Asians, or Aboriginals much; curious for a ‘racist’ group. I can’t seem to find anything to suggest that they care less about someone’s race. Now to be clear, there are probably racists amongst the Reclaim Australia camp, but the group as a whole doesn’t target anyone’s race, and nor is its views the same as the United Patriotic Front’s. ‘Equality and tolerance of all races and religions, freedom of speech, and the equality of gender’. Islam isn’t a race, so Reclaim Australia aren’t necessarily racist, as MP George Christensen has pointed out. They’re anti-Islamic extremism, which seems sensible. Their methods might be alarmist, unnecessarily offensive, and they seem to make a few too many generalisations about Muslims, but that doesn’t make them racist, or, more importantly irrelevant. So why exactly are the ‘anti-racists’ in the No Room For Racism camp so worked up? Maybe they don’t know Reclaim Australia’s mission statement, or maybe they’re just looking for a chance to let off some steam. Or, as I assume is much more likely, they perceive Reclaim Australia, and indeed any attempt to criticise Islam or other politically correct ideologies as unthinkable. Don’t believe it? Well imagine for a second how the reverse protest would look: some Muslim activists challenging the tenets of Christianity and confronting Christian extremists –I can’t imagine that the No Room for Racism group would be calling them ‘racist’ for some reason. So what do we do? Personally, I’m going to let the word ‘racist’ lose all its meaning as it gets hijacked to serve the politically correct whims of the day. Or not. Because doing that will make those who have experienced real racism feel that the prejudice they’ve felt is being diminished as the word is overused up to the point of incoherence. I also wonder whether we should bother considering what Reclaim Australia and others like them are saying. I might prefer to be intellectually lazy, including by not looking at their website, and just believe what I’m fed without looking for the other side to the story. Or, on the other hand, I might take the opportunity I have to think for myself, and not forfeit my independence of opinion. It takes a bit of effort to find the truth, but if it’s all that it’s cracked up to be, it must be worth it. This entry was posted in Politics, Middle East, & Islam by Pete. Bookmark the permalink.